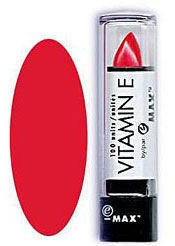 E-Max Vitamin E Lipstick is a healthy way to put some dramatic colour in your cosmetics. It not only looks good it's good for you. Buy 1 for $1.49Buy 2 / Save $0.08!Buy 3 / Save $0.30! Size (inches): 0.79" X 0.79" X 2.36"
Interests: Health? I just want to be pampered! Castor oil, butyl stearate, caprylic/capric, triglyceride, candelilla wax,petrolatum, lanolin, ozokerite, beeswax, polyethylene, mineral oil, carnauba, propylparaben, propylgallate, aloe extract, tocopheryl acetate. d&c red #6 Barium lake, d&c red #7 calcium lake, d&c red #21, d&c red #27 zirconium lake, d&c red #30 lake, d&c red #36 aluminum lake, d&c orange #5 zircuonium lake, d&c yellow #10 blue #1 aluminum lake, maganese violet, titaniumdioxide, iron oxides, mica, fragrance.